From literary giants to leading academics via world-class musicians, some of the world’s most celebrated minds have made London their home over the years. We’ve compiled some of the most interesting examples in the city for you to have a nosey round. What do one of Baroque’s greatest composers and the world’s most influential guitarist have in common? Answer: 23-25 Brook Street. With just a wall (and 200 years) between them, these Mayfair homes have been occupied by two musical greats: George Fridrich Handel and Jimi Hendrix. Initially opened in 2001 by the Handel House Trust, the museum comprises a carefully restored set of period rooms on the first and second floors of 25 Brook Street. In 2016, the museum expanded to incorporate the upper floors of its neighbour at number 23: Hendrix’s home from 1968–69. Visitors can explore where these masterminds lived, ate, slept and ultimately changed their respective musical landscapes. Handel and Hendrix in London is located at 23-25 Brook Street, Mayfair, W1K 4HB. It opens 11am - 6pm, Monday to Saturday, and entry costs £10 for adults and £5 for children. Yes, the most influential figure of the British Arts and Crafts movement is an E17 lad. The only public museum dedicated to the designer, the collection illustrates Morris's life, work and influence and includes printed, woven and embroidered fabrics alongside rugs, stained glass and painted tiles. It’s the perfect spot for crafts enthusiasts, allowing you to explore the stunning Grade II listed Georgian house where Morris’ family lived from 1848-1856. William Morris Gallery is located at Lloyd Park, Walthamstow, E17 4PP. It opens 10am - 5pm, Wednesday to Sunday, and entry is free. Located in idyllic Hampstead, 20 Maresfield Gardens was home to Sigmund Freud and his family after they escaped Austria following Nazi annexation in 1938. At the heart of Freud Museum London is Freud's study, preserved just as it was during his lifetime. Visitors can also discover Freud's extensive collection of antiquities - almost 2,000 items and ancient figures – and of course, his psychoanalytic couch. The museum also showcases the work, life and memories of Anna Freud. Sigmund’s youngest daughter, Anna continued to develop her own pioneering psychoanalytic work at the same address until her death in 1982. It was her wish that the house become a museum to honour her father. 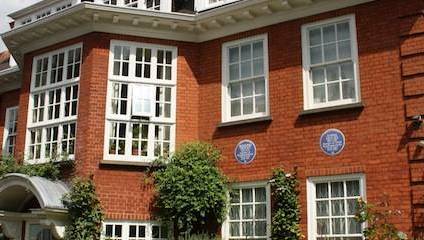 Freud Museum London is located at 20 Maresfield Gardens, NW3 5SX. It opens 12pm – 5pm, Wednesday to Sunday, and entry is £8 for adults, with concessions available and under 12s free of charge. This stunning Grade-I listed Hampstead house once played home to the Romantic poet John Keats. Originally a pair of semi-detached houses known as ‘Wentworth Place’, Keats resided in one half with his friend Charles Brown from 1818 – 1820 during what are generally seen as pivotal years in the young poet’s career. Keats House is now a writer’s house museum open to the public, where you can learn more about the poet by delving into original manuscripts and artefacts. The house really comes into its own via a series of events it hosts throughout the year, from poetry performances to family days. You can listen to Keats' poetry, watch a film about his busy life in Hampstead, or even create your own poem. Keats House is located at 10 Keats Grove, Hampstead, NW3 2RR. It opens 11am - 5pm, Wednesday to Sunday, and entry is £6.50 for adults, with concessions available and under 17s free of charge. And now for some ones you can’t explore…. A plethora of inspired minds have settled in our capital and, though not all their homes are open to the public, they’re still worth adding to your hit list. George Orwell occupied two London addresses during his time in the Smoke. Sitting in the heart of West London’s trendiest road, the brightly coloured 22 Portobello Road was Orwell’s first London home after resigning as Assistant Superintendent of the Indian Imperial Police in Burma. It is Islington’s 27b Canonbury Square that is considered his true London home though – in part because he wrote his dystopian masterpiece 1984 there – and this makes it a must-see for any literary fanatics. The father of British Glam, Bolan (like Bowie) was a London boy through and through. He was born in Hackney, raised in Stamford Hill, started gigging in Covent Garden, and ultimately died in a tragic car crash on Barnes Common. It was his flat on 57 Blenheim Crescent, just off Ladbroke Grove, where Bolan went from underground hero to a stalwart of British Glam. Although he moved out in ’71 when fame started to become too intrusive, this Notting Hill home (still yet to be Blue Plaque-d) is sure to delight anyone who loves to boogie on a Saturday night. Another blue-plaque for literary lovers: the house where J M Barrie wrote Peter Pan can be found on the sought-after Bayswater Road. The Victorian semi lies next to Kensington Gardens – an inspiration to the writer when penning his most famous story – and home to the famous Peter Pan statue erected in 1912.